Packed lunches. I'll be honest those 2 words often fill me with dread (usually because its not until 10pm that night I remember I've not made it!) We switched our M over to pack lunches about a year ago - when the school menu changed and I found out my son was choosing to eat a plain jacket and a fruit salad daily. (He is a fussy eater and needs a BIG push to try new things. He is also stubborn.) and making the change over to packed lunches had been a learning curve for me. Especially for a fussy eater. Towing that line between offering a lunch which is balanced, he will eat and fill him up for the rest of his school day. The team over at Flora commissioned a survey to look into the packed lunches that are heading into schools all across the country. They found out that 1.6% of primary school packed lunches in England are meeting the nutritional standards for school food. Flora are launching their latest campaign to help improve school lunches across the nation. The understand that we don't need a lecture on it, instead we need help, ideas and solutions to help us (at 10pm when we realise we have forgotten) to create a simple and healthy lunch. 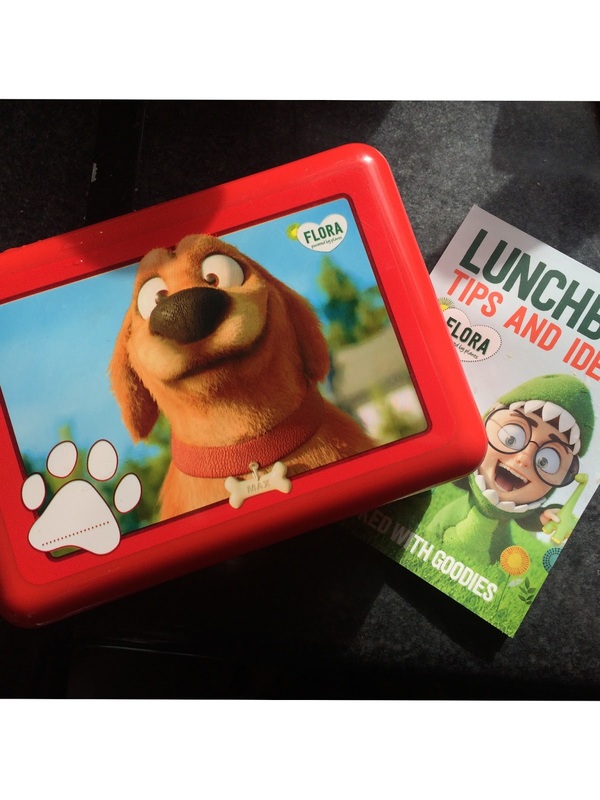 Flora have distributed 631,000 lunchboxes across the UK which contain easy to make and plant based recipes. 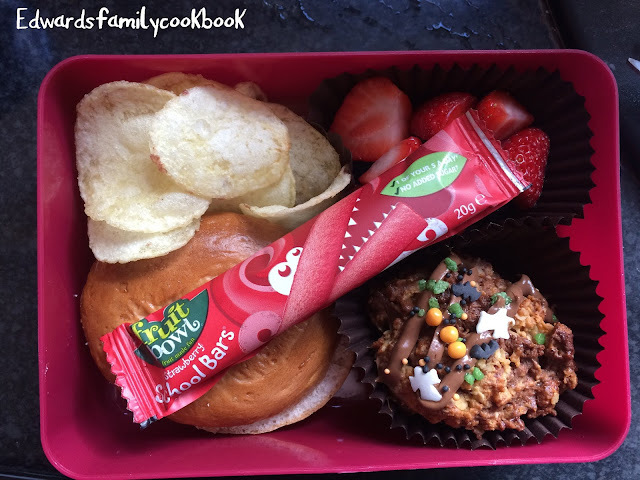 These little booklets are fab and is a puzzle piece to slot together a packed lunch which ticks all the boxes. The issue I have with my eldest is that he does not like cold things like ham or cheese - and will not eat pasta or cold cous cous. This leads very few options for us when making his lunch on a sandwich type. I really like the look of these Ham-Asaurus sandwiches - which you never know might get my cold meat avoiding son to maybe just maybe to try them. He has a problem with ceratin food textures, mainly "gooey" as he calls it - we just need to keep trying. This does mean I have to be a little bit more creative when it comes to my lunch options for him - as his "sandwiches" are around the same theme - a jam of some type or dairylea. I try and offer lots of fruit (which he loves) as well as some more snacky type bits alongside. The booklet does offer some fantastic ideas of chicken pittas and filled sandwiches (which I'm sure my youngest will love when we get to that age) but these options do not work for my biggest boy sadly. I put together a couple of lunches taking inspiration from the guide. This first lunch has a mini bagel with cream cheese in it. (I try occasionally sneaking in cucumber - it comes back in soggy half eaten mess or a sandwich uneaten) Then half a packet of some ready salted crisps, a mixed selections of fresh strawberries and blueberries, a fruit snack school bar and a homemade oaty chocolate bite. 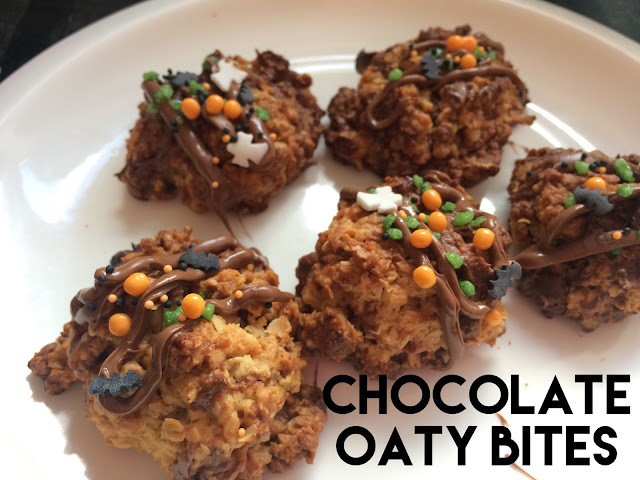 These bites are like little flapjacks and the recipe is from Ellas Kitchen Big Baking Book- based on their chunky oaty cookies. These were made by melting together butter, honey and golden syrup - before adding in oats and flour. I stirred in some chocolate drops also - as a little bit of a treat. Baked for 15 minutes then left to cool. Drizzled over a little melted chocolate and added a few Halloween sprinkles. This mixture made around 16 bites and the oats will give some slow release energy for the afternoon and little brains to work. 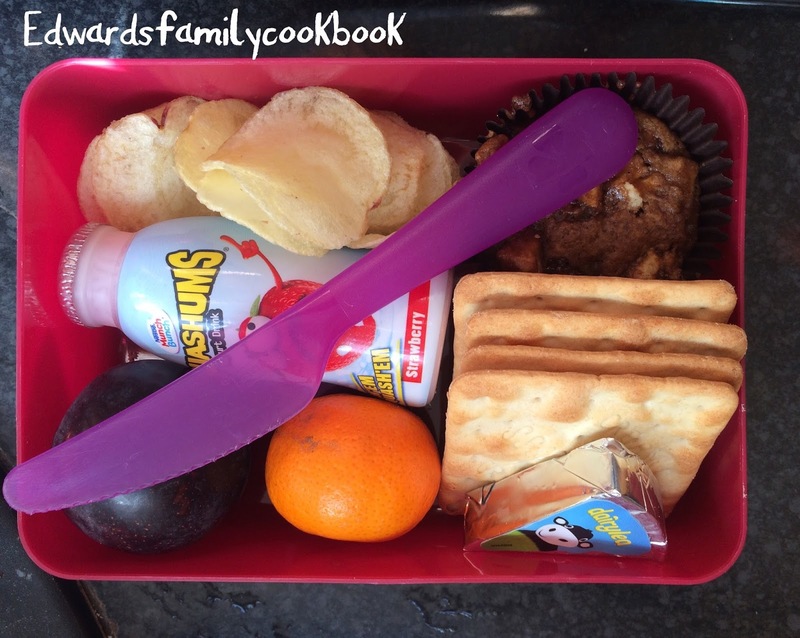 This lunch is 4 cream crackers and Dairylea triangle (an easy to digest cheese and biscuits), with the other half of the crisps, a plum and orange, a drinkable yoghurt and an mini apple cake. 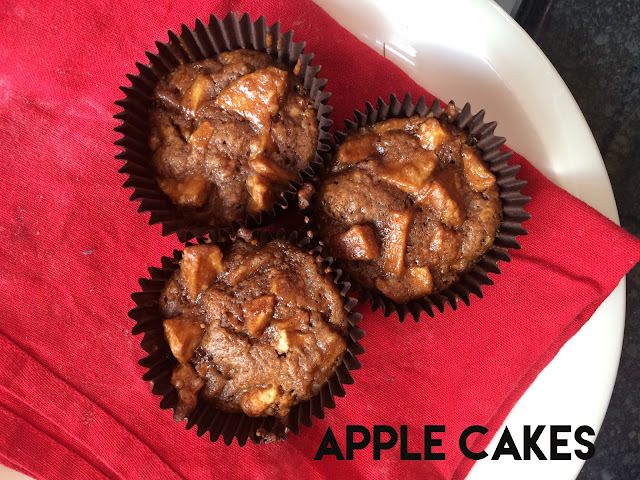 This recipe is great for using up those soft apples in the fruit bowl. Its a very light sponge mix but heavy on the baked apple. I used dark brown sugar which gives it a lovely caramel flavour. This recipe is from the really worth buying How to feed your whole family by Gill Holcombe based on her All in One Apple Cake. Using 5 sweet apples chopped and diced mixed with sugar and spices before adding in 2 eggs, a little flour and some oil. Stirring together you get almost a pancake type mixture. I baked these into small cases rather than one big cake. These are a nice little sweet end to a little lunch for little fingers. My boy is growing big and is always on the go - keeping him in food, and interesting food is one that will be a continual battle in our house. Keeping giving him things he is not keen on and balancing in that alongside foods he will eat is what is working for us right now.